The Firefly Clamplight flashlight can clamp to your belt, pocket, laptop, tackle box or almost anywhere else you can think of. The spring clip can be attached to a tool belt or backpack. 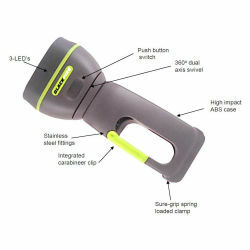 The head swivels in virtually every direction to get light where you need it. It uses 3 LEDs for a bright light. It’s like no other flashlight in the world. The Firefly features include: 360° dual axis swivel, clamps, clips, and it floats, Constructed of tough, lightweight, high performance ABS plastic.